The deck floor roll forming machine consists of hydraulic decoiler, main forming machine, hydraulic cutting, product stand, hydraulic system and electric system. The design which has embed buckle on the web plate provides excellent bonding between steel plate and concrete. This equipment from Changsheng Company has a better effective height and stronger resistance, because its plate is wholly covered by concrete. The steel plate made by this deck floor roll forming machine has property of superexcellent fireproof. Additionally, it has the advantages of quick and simple operation, longer service time and so on. The deck floor roll forming machine is used to construct skyscraper, residential building and bridge. Yingkou Changsheng Steel Structure Project Co.Ltd is a professional manufacturer and supplier of deck floor roll forming machine in China. 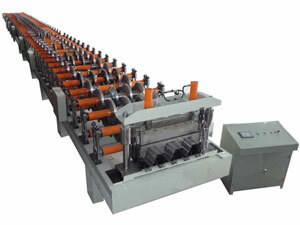 Apart from deck floor roll forming machine like roof panel roll forming machine, glazed tile roll forming machine, etc. we also offer auxiliary equipment products like automatic tube bending machine, plate bending machine, etc; high pressure polyurethane insulation painting machine including low pressure polyurethane foam machine and high pressure polyurethane foam machine; k-span machine, like automatic building machine, ultimate building machine and arch style buildings forming machine. With good quality and affordable price, the products produced by our company has exported Germany, Holland, India, Indonesia, New Zealand, Syria, United Arab Emirates, Russia, Kuwait, South Africa, and Bangladesh. If you are interested in our products, please contact us for details.